Take a peek inside Equestria with the My Little Pony Explore Equestria Magical Scenes Pinkie Pie pony figure! Look into this 3-inch Pinkie Pie pony’s cutie mark to reveal a secret scene. 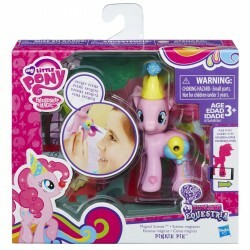 Then put the party hat accessory on her head and pretend you’re joining Pinkie Pie at one of her fun parties! Scan your pony’s code to unlock even more fun in the My Little Pony Friendship Celebration app! Includes Pinkie Pie pony figure and party hat accessory. Pony measures approx 3 inches (7.5cm). Suitable for age 3 + years.